One of the wonderful spin offs of the 1994 film Forrest Gump was the album containing its sound track. Director Robert Zemeckis used popular songs to indicate the passage of time and social context. The result was a film about an individual that was more than the individual and felt the sum of its parts. Climbing – indeed anything we do – is similar. Everything has its ecosystem. George Mallory was a gifted climber. But you won’t understand why he was what he meant to the British, unless you understand the First World War and its impact on Britain. That understanding is what Wade Davis offered in his book, Into the Silence. 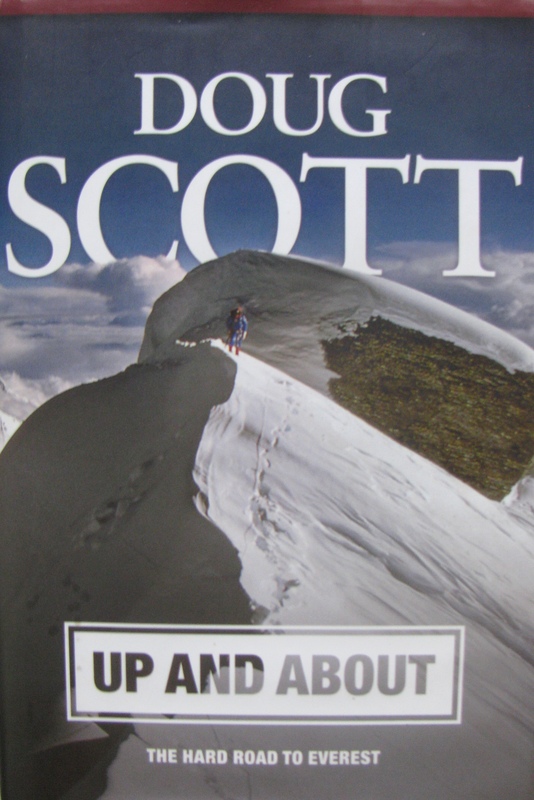 For some time into reading Doug Scott’s autobiographical work: Up And About, The Hard Road to Everest, I wondered how I – an Indian – would relate to the meticulous detailing of his growing up years, ranging from incidents and persons to hills, rivers – indeed the geography – of those parts of Britain and Europe, he moved through. It felt alien. Among most accomplished mountaineers of the twentieth century, Scott has strong roots in rock climbing. Rock climbs, unlike the panoramic scale of mountaineering, is less universe and more specifics. Scott writes those initial chapters like a rock climber who traded piton for pen. You meet every crack and chimney. Such is the recall and detailing of life. About a quarter of the way, the book opens up to a chapter of exploratory climbing in Chad (Africa) and slowly but steadily, in a pattern that reminded me of Forrest Gump’s soundtrack, all those details about his life and times alluded to, provided context. Scott was born in 1941, roughly two years after the Second World War commenced; his childhood included the years Britain was bombed by Germany. Nineteen years later, The Beatles was formed in Liverpool and by the late 1960s and the 1970s when Scott was in the thick of climbing, the post war world had journeyed into Cold War, Vietnam war, Prague Spring, student movements, civil rights movements and Woodstock. Youth was experimenting; established conventions were being questioned, cultures were blending at their edges, freedom was valued. Curiosity for wider world births the urge to travel, including to remoteness. Adding flair is the fact that some expeditions featured road trips bridging continents. The expedition to the Tibesti Mountains of northern Chad for instance, has Scott – a person interested in geography and history – and his friends, driving through the Sahara to access their chosen climbs. At other times, to get around affordably in Europe, he becomes adept at hitch hiking. Commitment to one’s passion soon forces that response from employer: maybe you should choose between work and climbing? The teacher who also climbed becomes full time climber. That transition and the changing times take their toll on marriage, wife and family life. The book takes you through all this and more to Scott’s successful ascent of the South West face of Everest with Dougal Haston in 1975. The book’s finest hour is arguably the narrative of Scott in Yosemite, the cradle of big wall climbing – a chapter in climbing’s history that was intermingled with the social trends influencing young people then. Unlike today when much of sport (including climbing) has devolved to a furtherance of the same competitive urges one sees at work places and therefore harks of conformism, big wall climbing in Yosemite was alternative lifestyle and imagery in the days of its pioneers. While the extent of Scott’s willful embrace of counterculture is a matter of conjecture (at its strongest, it is only obliquely indicated as in others describing him as a hippie), he does transform in the book’s photos from bespectacled clean shaven look to bespectacled, long haired and bearded, with at times, a head band; a sort of Bjorn Borg of the climbing world. Scott mentions that he hasn’t written everything about his life but there is anyway much poured into the book. This is one of those rare books on climbing being published in recent times that bears a classical stamp. By that I mean the survival of research and reflection despite the popular association of climbing with action, often action for action sake. In the late 1990s, when I got into climbing and was eagerly sampling rock climbing videos, the bulk of them had a dull ring to it. You said “wow!’’ seeing the movement but little else intrigued. In subsequent years, the visuals improved dramatically with technology but the question remained – is being aware and reflective, a baggage in climbing? Scott may not be young anymore; he is in his mid-seventies, but the restoration of reflection to a narrative on climbing is welcome reminder of what a life in climbing can actually be – it’s all about evolving. And, that glance backward becoming richer by the evolution. The classical feel is also in part thanks to the other climbers mentioned or profiled in the book – names like Don Whillans, Joe Brown, John Hunt, Peter Habeler, Dougal Haston, Royal Robbins, Tom Frost, Warren Harding and Chris Bonington; all names from an era when climbing still meant exploration of terrain and technique. In contemporary world where fame and not necessarily life lived, qualifies people to write autobiographies, a book that traces the evolution of a life lived, world in which life was set and one’s chosen sport, is definitely worth reading. Don’t expect it to be a breeze. Like any climb, this is a book you have to be patient with, moving from hold to hold with struggles in between before you see it all in retrospect. Up And About, The Hard Road to Everest, the first part of Doug Scott’s autobiography, won The Himalayan Club’s Kekoo Naoroji Book Award for 2016. Scott received the award at the club’s annual seminar in Mumbai recently. This entry was posted in Books, People. Bookmark the permalink.